President Akufo-Addo was speaking at the National Governors Association 2018 Winter Meeting. 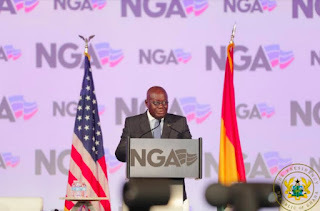 These were the words of the President of the Republic, Nana Addo Dankwa Akufo-Addo, when he delivered the keynote address at the National Governors Association 2018 Winter Meeting, in Washington DC, United States of America, on Sunday, 25th February 2018. With President Akufo-Addo becoming the first African leader to address to address the 50 US Governors at an NGA meeting, he noted that a key challenge of Ghana’s economy, like many other economies in Africa, is the infrastructural deficit. He told the Governors that Ghana is embarking e embarking on an aggressive public-private-partnership programme to attract investment in the development of both road and railway infrastructure. Apart from prosecuting the agenda of building, with the private sector, at least one factory in each district of Ghana, the President indicated that the time has come for Ghana to develop strategic industries out of its abundant natural resources of bauxite and iron ore. The President also used the opportunity to reaffirm the commitment of his government and the people of Ghana in standing shoulder to shoulder with the United States in the promotion of human rights on the African continent, and across the globe. “We stand shoulder to shoulder with the United States in the rejection of terrorism as a legitimate means of resolving political issues. We appreciate the courageous commitment and the lead role being played in the fight against terrorism by the United States in several parts of the world, including the Sahel region of West Africa,” the President said.